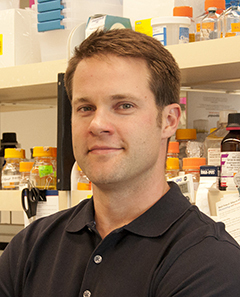 Adam Feist, a UC San Diego bioengineering alumnus (PhD) and current Project Scientist, has been awarded the Jay Bailey Young Investigator Award from the Society for Biological Engineering. The journal Metabolic Engineering sponsored the 2018 award, and they put together a nice story about Adam Feist and his work in the Systems Biology Research Group run by UC San Diego bioengineering professor Bernhard Palsson. One of the things Feist works on, and discusses in the article, is harnessing evolution as a tool. Feist is also Senior Researcher and Group Leader at the Novo Nordisk Foundation Center for Biosustainability, Technical University of Denmark (DTU).